At the invitation of the government of the Republic of South Africa, President Xi Jinping's Special Representative and member of the Political Bureau of the CPC Central Committee Yang Jiechi will pay an official visit to South Africa from March 23 to 24. Q: Do you have more details about the purpose and schedule of Mr. Yang Jiechi's visit? What's China's expectation? A: Member of the Political Bureau of the CPC Central Committee Yang Jiechi's upcoming official visit to South Africa as President Xi Jinping's Special Representative is an important visit to Africa by Chinese central leadership after the Two Sessions this year. With a view to following through on the policy of sincerity, real results, affinity and good faith and the principle of upholding justice while pursuing shared interests put forward by the report submitted to the 19th CPC National Congress, this visit will enable an in-depth interaction and policy synergy on bettering bilateral relations and across-the-board cooperation and development, so that China-South Africa cooperation will bring more benefits to the two countries and two peoples. During the visit, Special Representative Yang Jiechi is expected to meet with leaders of South African political parties and government and they will exchange views on China-South Africa relations, the 2018 Forum on China Africa Cooperation (FOCAC) Summit in Beijing and the BRICS summit in Johannesburg, among others. This year marks the 20th anniversary of the establishment of diplomatic ties between China and South Africa. Over the past 20 years, with the concerted efforts of both sides, the bilateral relationship has developed in an in-depth manner and been elevated from partnership to strategic partnership and then comprehensive strategic partnership, demonstrating good momentum for development in political mutual trust, economic and trade cooperation, cultural and people-to-people exchange and strategic coordination. China highly values its relations with South Africa. 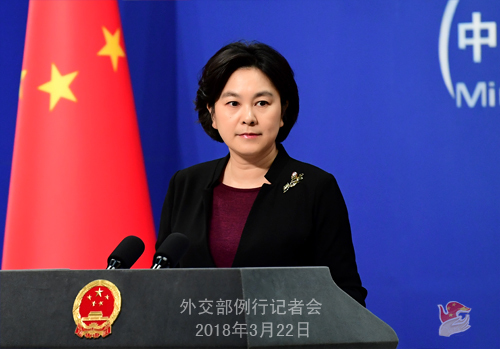 China stands ready to, taking the 20th anniversary of the establishment of diplomatic ties as an opportunity, support the 2018 Forum on China Africa Cooperation (FOCAC) Summit in Beijing and the BRICS summit in Johannesburg, continuously deepen China-South Africa friendly cooperation across the board, and keep moving forward the China-South Africa comprehensive strategic partnership. Q: A senior US diplomat gave a speech yesterday in Taipei, in which he said that "Taiwan-US relations" had never been stronger and he praised Taiwan as a "model" for the Indo-Pacific region. The Taiwan authorities announced today that another senior US official will be visiting this week from the Commerce Department. What is your response to the comments yesterday and this second visit in a week by a senior US official to Taiwan? A: Yesterday I already made clear China's stance on the recent contacts between the US and Taiwan. I want to stress again that the Taiwan issue concerns China's core interests and is the most important and sensitive issue in China-US relations, and the one-China principle is the political foundation of China-US relations. We urge the US to adhere to the one-China policy and the three joint communiqués, stop pursuing any official ties with Taiwan or elevating its current relations with Taiwan in any substantive way and handle Taiwan-related issues cautiously and properly so as to avoid causing any major damage to the China-US relations and cross-Straits peace and stability. I would also like to remind those who want to play the "Taiwan card" or have any other attempt that they need to attentively read and study President Xi Jinping's important remarks delivered at the closing ceremony of the First Session of the 13th National People's Congress (NPC), in particular the part that involves China's attitude on upholding its sovereignty and territorial integrity. Not a single inch of our great motherland could be ceded from China. We hope relevant persons will speak and act with caution on the Taiwan issue. Q: According to reports, the White House said that President Trump is going to sign a Presidential Memorandum concerning China's "economic aggression" on March 22 EST. What's your comment? 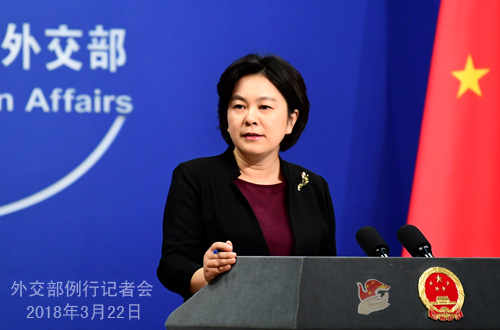 A: In response to recent reports that the US will shortly publish the results of Section 301 investigation and possibly impose restrictive measures on China, the official from the Department of Treaty and Law of the Ministry of Commerce has made a statement to clarify China's position again, that is, we firmly oppose the US' acts of unilateralism and trade protectionism. 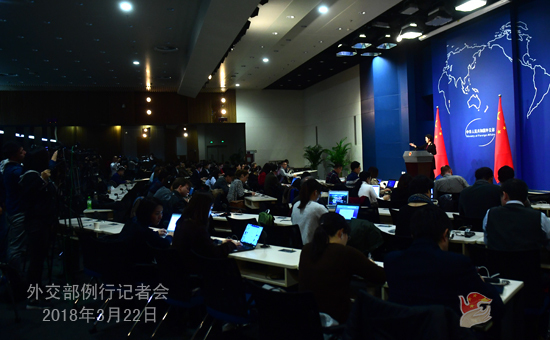 China will never sit idly and let its lawful rights and interests be undermined and will surely take all necessary measures to firmly safeguard its legitimate rights and interests. We hope that the US can be fully aware of the mutually beneficial and win-win nature of China-US economic and trade relations and refrain from moves that will hurt both itself and others. We have also noted some reports accusing China of "economic aggression", a term we can never agree with or accept, because China could not be labeled as aggressive at all in any way. Q: Three US Republican lawmakers have proposed that the Confucius Institutes operating in the United States should be registered as "foreign agents". I assume the Chinese government would be extremely unhappy to see this happening. Do you have comments on this? A: The Confucius Institutes in the US are set up at the voluntary request of US universities by Confucius Institute Headquarters, Chinese universities and local universities with the principle of mutual respect, friendly consultation, equality and mutual benefit upon formal agreement. The purpose of Confucius Institutes is strengthening educational and cultural exchange and cooperation between China and other countries and enhancing mutual understanding and friendship between their peoples. In fact, we have seen that Confucius Institutes are warmly welcomed in many countries and they have played an important role in promoting the mutual understanding, friendship and cooperation between China and relevant countries. I noted that recently certain American individuals have made noises from time to time, which actually comes down to the way they view the world and China's development or the question whether they are really able to discard the cold-war mentality, zero-sum game mindset and the outdated either-or concept and pursue mutually beneficial and win-win cooperation with other countries. Such noises always remind me of a saying from the Analects of Confucius, that is, "while a gentleman is open and poised, a petty man is unhappy and worried". China's commitment to the path of peaceful development has been enshrined in the reports delivered to the 17th, 18th, 19th CPC National Congress and the Party's Constitution. The amendments to China's Constitution adopted at the First Session of the 13th NPC add to the Preamble such new contents as "following a path of peaceful development and a win-win strategy of opening-up" and "building a community with a shared future for mankind". This constitutes the highest proclamation of China's foreign policies and philosophies in the form of law, demonstrating its firm resolve to blaze a development path different from that of traditional major countries, its sincere aspiration to work with other countries for common development and prosperity, its lofty goal to make greater contributions to world peace and development, and its global horizon, broad vision and sense of responsibility as a major country to integrate its own development into that of the world. It's only natural that certain individuals falling short of such vision and broad-mindedness will fail to apprehend it. We hope that they will abandon the obsolete ideas and truly think and act in a manner in keeping with the 21st century and look at the trend of the times and China's development in an objective and rational way. Q: Japan's Liberal Democratic Party is now in a discussion for revising the Constitution. In particular, a principled plan may be put forward to revise Article 9. How does China view Japan's move to revise the Constitution? A: In essence, the revision of Japan's constitution belongs to its internal affairs. But due to historical reasons and other reasons we all know, the issue of Japan revising the Pacifist Constitution has been all along followed by the international community and its Asian neighbors. Moreover, certain people in Japan have been seeking excuses for arms expansion by playing up this or that kind of so-called threats. We hope that Japan will adhere to a peaceful development path and win the trust of its Asian neighbors and the international community with concrete actions, and by doing so, create conditions for the improvement of its relations with its neighbors. Q: Just return to this memorandum that is expected to be signed at the White House today. Has China made any efforts to head off the trade sanctions and investment restrictions that are expected to be announced? Have the two sides discussed this on any occasion? A: China and the US maintain communication with each other on trade issues at various levels. The two sides have basic consensus in this respect which is to properly manage and constructively address trade disputes through communication and consultation based on mutual respect and win-win results to ensure the sound and steady development of China-US economic ties. I believe this is a consensus shared by the two heads of state which also marks out what the two countries should work for. Some people in the US have recently talked about potential restrictive measures on China. I noticed that "fairness" or "reciprocity" has been the catchword for the US side these days. We said earlier that trade imbalance between China and the US is a result of many factors, one of which is the US policy restricting its exports to China. China's market receives the largest number of US planes and soybeans and the second largest number of US cars and cotton. The figure I saw is that 62% of US soybeans and 25% of its Boeing planes ended up in China. What we export to the US is mostly something they have no comparative advantage in making or do not make at all. Everyone knows that it is impractical and unreasonable to demand for absolute parity in the world of trade. Let's all think about this. The US is on the one hand urging China to buy what it wants to sell, while refusing to sell what China wants to buy. Is the US in the right position to criticize China on trade imbalance? Is it fair? How many toys do we have to sell to equal the value of one Boeing plane? To put it another way, is the US willing to buy the same number of C919 from China as we buy Boeing from the US? That is why we have been calling on the two sides to calm down and have constructive dialogue and consultation in the spirit of equality, mutual benefit and mutual respect to seek out a win-win solution. As the world's top two economies, China and the US shall play a leading and positive role in ensuring world economic stability. That also serves the common interests of the two countries. Follow-up: You mentioned soybeans and Boeing there. Are those two areas where we could see possible retaliation if there are tariffs as we expect? A: China's trade and economic departments will handle these specific issues properly. Like I said, official from Department of Treaty and Law of the Commerce Ministry already made it clear that China will not sit idly by while legitimate rights and interests are hurt, and we will take all necessary measures to firmly defend our rights. Q: If the relevant parties asked China, would China be willing to host talks between the US and the DPRK? A: China always believes that the Korean Peninsula issue shall be resolved through dialogue and consultation, and we support all efforts that could facilitate its political settlement. We will readily support all efforts that are conducive to resolving the issue in a political way through dialogue and consultation.